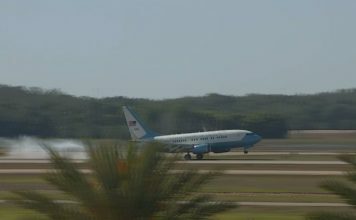 Vice President Mike Pence has departed Sanibel to head back to D.C.
Jordan’s king appealed Sunday to U.S. Vice President Mike Pence to “rebuild trust and confidence” in the possibility of a two-state solution to the Israeli-Palestinian conflict, following fallout from the Trump administration’s decision to recognize Jerusalem as Israel’s capital. Pence, in turn, tried to reassure the monarch that the Trump administration remains committed to restarting Israeli-Palestinian peace efforts and views Jordan as a central player. 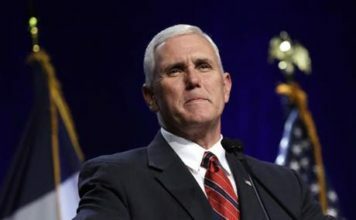 The vice president also said that “the United States of America remains committed, if the parties agree, to a two state solution.” Such a caveat deviates from long-standing U.S. support for a two-state solution as the only possible outcome of any peace deal. Trump’s pivot on Jerusalem last month infuriated the Palestinians, who seek the Israeli-annexed eastern sector of the city as a future capital. They accused the U.S. of siding with Israel and said Washington can no longer serve as a mediator. It posed a dilemma for Abdullah, who is a staunch U.S. ally, but also derives his political legitimacy in large part from the Hashemite dynasty’s role as guardian of a key Muslim site in Jerusalem. Any perceived threat to Muslim claims in the city is seen as a challenge to Jordan, where a large segment of the population is of Palestinian origin. He said Jordan would continue to play a central role in any future peace efforts. 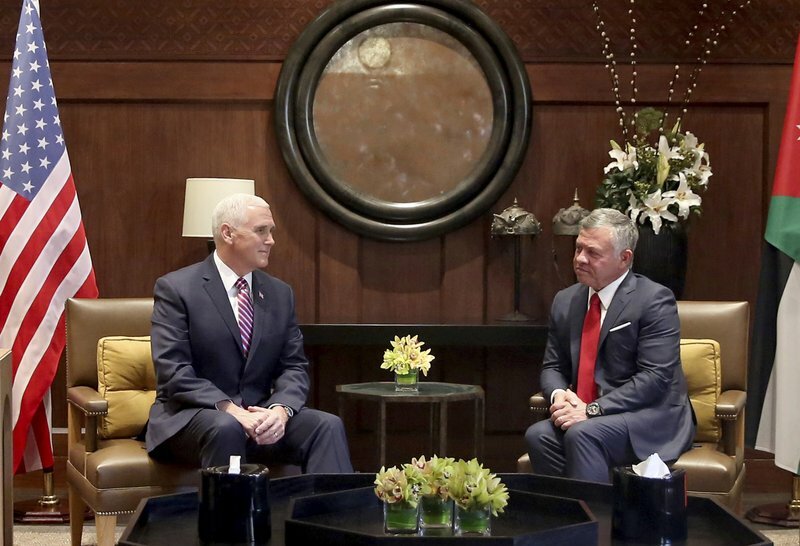 The vice president also praised Jordan’s contribution to a U.S.-led military campaign against Islamic State extremists who in recent months were pushed back from large areas in Iraq and Syria, both neighbors of Jordan. A longstanding international consensus holds that the city’s final status should be decided through negotiations, which was also U.S. policy going back decades. In a new expression of that snub, Abbas overlapped with Pence in Jordan from Saturday evening to midday Sunday, when the Palestinian leader flew to Brussels for a meeting with EU foreign ministers Monday. There, Abbas is expected to urge EU member states to recognize a state of Palestine in the pre-1967 lines, and to step up involvement in mediation. “Any plan from any side should be based on the basic references, which are the U.N. resolutions on the establishment of a Palestinian state on the borders of 1967, with east Jerusalem as a capital, and the Arab Peace Initiative, which addresses many issues, including the issue of refugees,” he said.